Our sweet Halie can to us a little on the fluffy side, 65 pounds. She should be 45. Our vet and Debbie helped us find the right food for her. After trying several types we found the right one for her. She lost 20 pounds and has remained at her ideal weight now. 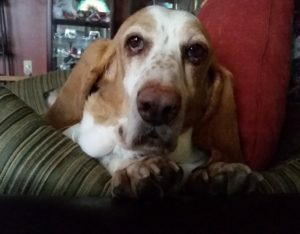 As an older basset hound, it’s so important for her to stay at this weight, we want to keep her in the best shape possible. She doesn’t have any back problems that is so common to bassets. Thank you 4 Paws, and to all the staff who order her food so faithfully, she’s healthy because of you!